NanoTemper Technologies develops, manufactures, and markets highly innovative instrument and software solutions for biomolecular analytics. A reputation for excellent products and services has made them the partner of choice for thousands of researchers worldwide, across pharmaceutical, biotechnology, and academic settings. Visit booth #1405 and the poster at SLAS to discuss your projects with their Application Specialists. You will learn how to significantly shorten drug discovery and development timelines by employing their unique and proprietary technologies for biophysical characterization of biomolecules. For example, you can maximize productivity using MicroScale Thermophoresis (MST) by forming rapid and reliable conclusions from your affinity screening data. In formulation development, nanoDSF allows you to predict long-term stability of biopharmaceuticals in only a few hours, using a combination of thermal and chemical unfolding analyses. In 2016, NanoTemper Technologies launched the novel Monolith His-Tag Labeling Kit. This convenient kit allows site-specific, purification-free labeling of small amounts of His-tagged proteins or peptides, using a simple mix-and-measure approach. Dr. Debora L. Konz Makino (CRELUX GmbH - a WuXi AppTec company) was one of the first MST users to try the kit. Dr. Debora L. Konz Makino CRELUX GmbH - a WuXi AppTec company. 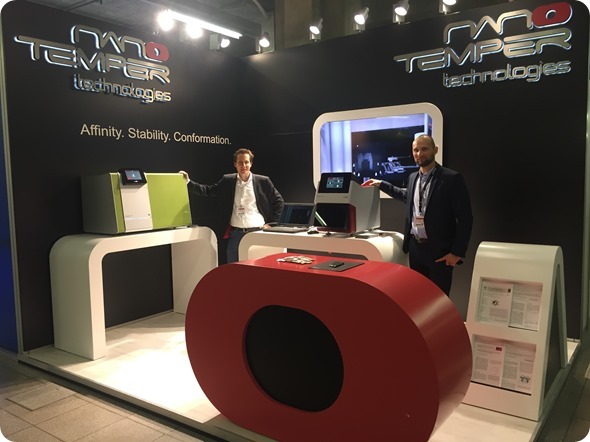 NanoTemper Technologies has made the Growth Champions 2017 list along with some of Germany’s most successful companies. “Our customers value our high-quality products, and appreciate our service and knowledgeable support. We are successful because our customers are successful”, said Dr. Philipp Baaske, CEO of NanoTemper Technologies, after receiving the award. Getting curious? NanoTemper Technologies is looking forward to meeting you at booth #1405!